A staple of television for many years, Jack Klugman, has died at the age of 90. He passed away earlier this afternoon in Northridge, CA. Klugman co-starred in the original Broadway production of Gypsy with Ethel Merman and movies like 12 Angry Men, Days of Wine and Roses, and Goodbye, Columbus. Still, he was best known for his work on television. He guested on numerous shows during his career, most notably The Fugitive, four episodes of The Twilight Zone, Diagnosis Murder, Third Watch, and game shows like Password and Match Game. 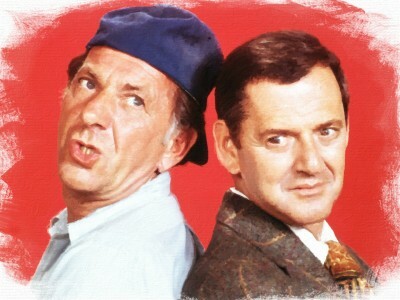 In 1970, he began a five year run with Tony Randall in ABC’s sitcom, The Odd Couple. He’d replaced Walter Matthau in the original Broadway production of the play. Playing messy sportswriter Oscar Madison to Randall’s spotless Felix Unger, Klugman won two Emmy Awards. The show ended in 1975 with Felix remarrying his ex-wife and finally moving out of Oscar’s apartment. It was one of the few sitcoms of that era to have an ending. Klugman hit TV paydirt again with a dramatic series — Quincy, ME. This time, he played a pathologist who ended up solving murders. It began as a series of rotating movies but was soon spun off into its own series and he played the character for seven years. He returned to sitcoms with You Again?, starring opposite John Stamos on NBC. Klugman played a gruff divorced father who got the chance to know his young adult son after a 10 year separation. The show lasted for two seasons and 26 episodes. The actor was a heavy smoker and was diagnosed with throat cancer in 1974. He lost a vocal cord in 1989 and that fact was written into the 1993 CBS reunion movie, The Odd Couple: Together Again. He and Randall were close friends and Randall persuaded Klugman to return to the stage in a production of The Odd Couple play, to benefit Randall’s National Actors Theatre in New York. A year later, they reunited on Broadway in a revival of The Sunshine Boys. Randall died in 2004 and Klugman delivered the eulogy. The next year, he authored a book about their friendship, Tony And Me: A Story of Friendship. Klugman and Match Game staple Brett Somers — who also played Oscar’s ex-wife on The Odd Couple — were married in 1953. They had two sons and were legally separated in 1974 but remained married until her death in 2007. He had a long-term relationship with Peggy Crosby and they wed in 2008. Klugman died at his home with his wife by his side. He is survived by Peggy, his two sons (David and Adam), and two grandchildren. What do you think? What are your favorite memories of Klugman’s work? More about: Quincy M.E., The Odd Couple (1970), You Again?